Western blot analysis of extracts from HeLa cells synchronized in G0, G1/S or Mitosis, using Phospho-CDK2 (Thr160) Antibody. Flow cytometric analysis of untreated Jurkat cells, using Phospho-CDK2 (Thr160) Antibody versus propidium iodide (DNA content). 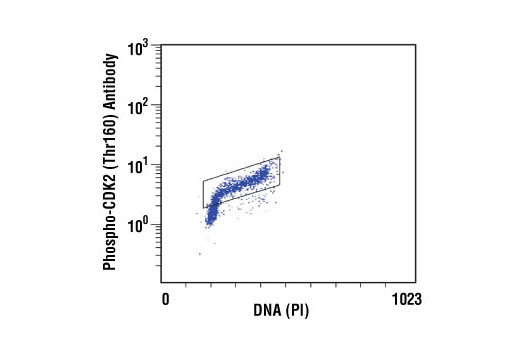 The boxed population indicates phospho-CDK2 (Thr160)-positive cells. 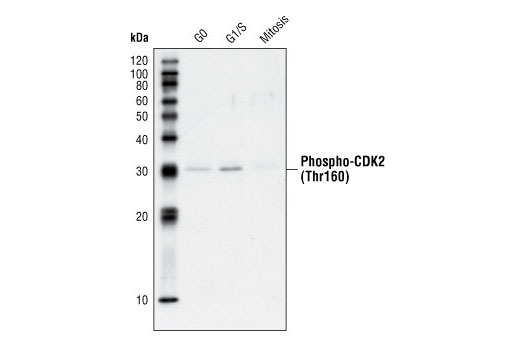 Phospho-CDK2 (Thr160) Antibody detects endogenous levels of CDK2 only when phosphorylated at threonine 160. The antibody weakly cross-reacts with cdc2 phosphorylated at Thr161. It does not cross-react with other phosphorylated cyclin dependent kinases. Polyclonal antibodies are produced by immunizing animals with a synthetic phosphopeptide corresponding to residues surrounding Thr160 of human CDK2. Antibodies are purified by protein A and peptide affinity chromatography.